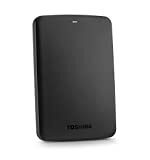 Amazon has the toshiba Canvio basics 1TB portable hard drive - black (HDTB310XK3AA) for $49 with free shipping. Sells for $64+ Highest Price. Deals for $35 Lowest Price. Normally $51+.